NEW YORK -- Marco Rubio is showing off his Spanish while campaigning in Houston - but ducking an unexpected question put to him in the language. As he addressed hundreds of cheering supporters in a hotel conference room, the Florida senator grinned when a man yelled, "Viva la Constitution!" 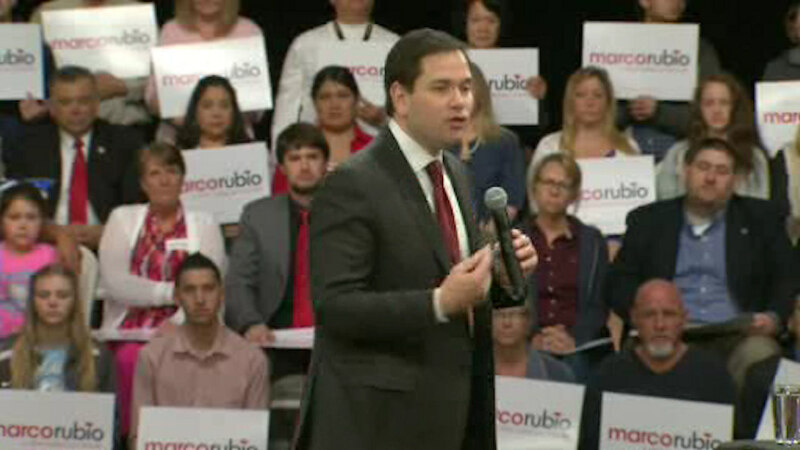 Many in the crowd laughed and Rubio responded, "You're from Texas, you know what he said." But when another man yelled in Spanish, "Senator, how are you going to win the Latino vote?" Rubio said in English, "Let me finish my speech." Moments later, he referenced the question and said he wanted to win over all Americans. That prompted a woman to yell, "What about Muslim-Americans?" Rubio answered, "The debate's tomorrow." The next GOP debate is Thursday night at the University of Houston. Meantime, Hillary Clinton says there are a "lot of Flints" out there and she wants to help them. Speaking to about 500 people at Morris College in Sumter, South Carolina, Clinton stressed her commitment to helping Flint, Michigan, which is dealing with a lead-contaminated water crisis. Flint is a majority black city and Clinton questioned if this would have happened in a "white, affluent suburb of Detroit." Clinton said there are other communities going through the same problems and if elected president, she would create a wall of maps in the Executive Office Building, marking where there are water problems, sewer problems and other issues. She says the "most basic thing" government should offer is "a healthy start in life. Bernie Sanders is getting a little firsthand folk music education. Before a rally in Tulsa, Oklahoma, Sanders and his wife stopped by the Woody Guthrie Center and met with fans and voters awaiting them on the sidewalk. In the 1980s, Sanders recorded a spoken-word album of folk favorites including Guthrie's classic "This Land is Your Land." Folk classics have been part of the warm-up music at Sanders' rallies. On the Republican side, Donald Trump is hitting back after Mitt Romney suggested that a "bombshell" is lurking in the tax returns he has so far refused to release. Romney was the GOP nominee in 2012. Trump says on Twitter that "Mitt Romney, who totally blew an election that should have been won and whose tax returns made him look like a fool, is now playing tough guy." Romney said in an interview with Fox News that Trump's foot-dragging on releasing his returns suggests he has something to hide. Trump endorsed Romney in 2012 but has been deeply critical of the former Massachusetts governor's performance as a candidate since mounting his own run. He adds that when Romney asked for his endorsement, "he was so awkward and goofy that we all should have known he could not win!"